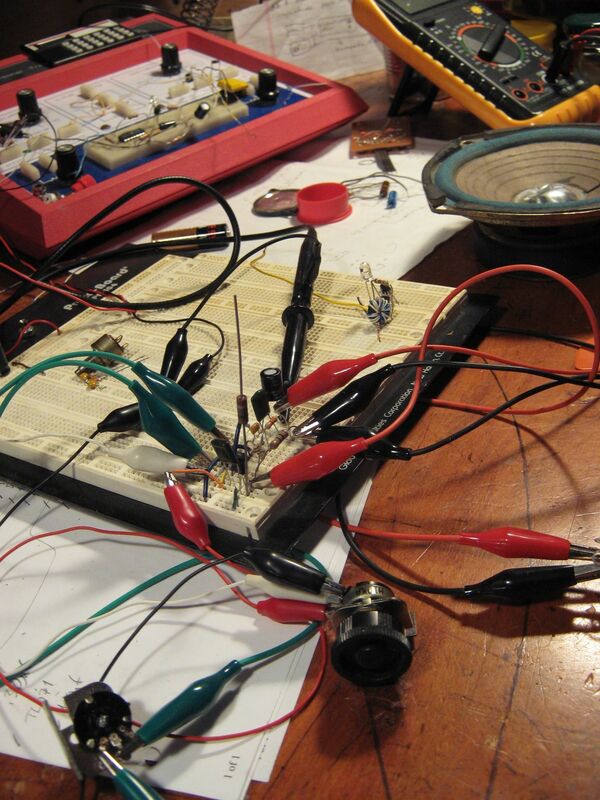 One of the things I have been wanting to do almost since I got an electric guitar – over ten years ago – is to build some of my own effects pedals. I decided earlier this summer (2012) that I am actually going to do that, by golly, and not just true bypass mods and control switchboxes like I’ve done in the past. Real analog effects circuits this time. Then I realized that I wanted a way to test things at my electronics bench without lugging my mega-ton 112 combo up and down two flights of stairs and decided I needed a practice amp first. I could buy one of those, I guess, but I want to build stuff – why not that, too? And I managed to do it for practically free. Existing amps all fail for at least one of those reasons, usually by not being dirt cheap. That’s really why I’m building this, besides being able to say “I built that, and it works”. 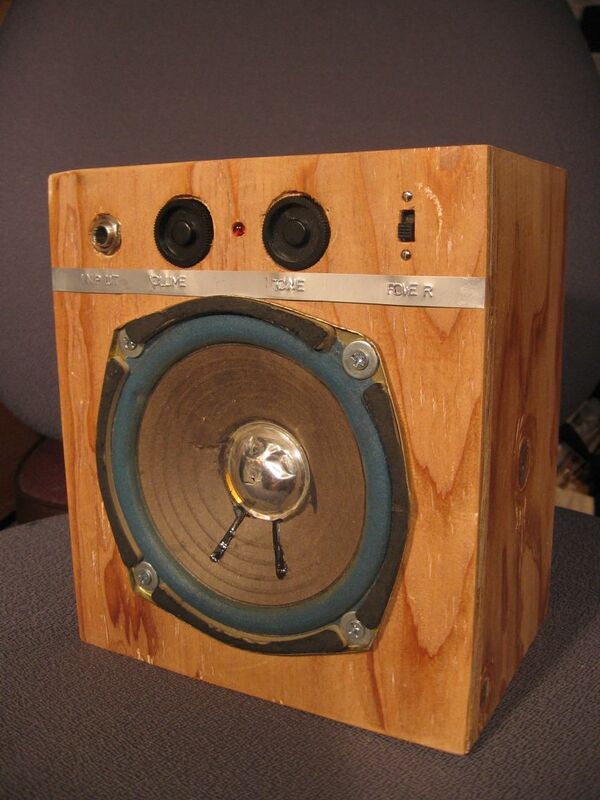 Idea 1: A super basic class-A tube amp. That would be cool, but is pushing the simplicity envelope for some who has never really worked with valves before. There also don’t seem to be very many single-tube amp designs out there with any decent reputation. The AX84 or an Epiphone Valve Junior clones are close, but not as simple as I wanted. Necessary transformers also get pricey quickly and tube amps usually require a wall plug – not as portable. Idea 2: Pignose clone. That’s more transistors than I want to tackle soldering for my board-burning re-entry to building stuff, never mind finding them (or equivalents) and the output transformer somewhere. Idea 3: Chip amps are the jackpot. Definitely not known for killer guitar tone, but is certainly reasonable for a test amp and fits every other bill pretty well. Turns out there are a slew of competing LM386 designs (or almost non-designs) that are not terribly complex and easily run on a 9V battery. I eventually settled on the Ruby amp from runoffgroove.com as a somewhat proven, simple design with more frills than a Smokey Amp. I built this mostly with parts I had on hand. I did pick up an MJ386 instead of the lone LM386 I had in my chip drawer and picked up some of the less common resistor values, but other than that I subbed ballpark component values for prototyping. I used the 0.1uF cap of the “Bassman” mod for a little more low-end and a 5k gain pot because that’s what was in my pot bin – and I had matching 10K and 5K pots with matching knobs. The low-end is also helped out a teeny bit since I’m using a 4-1/2″ Hi-Sound woofer that I think was from a stereo speaker at one point. 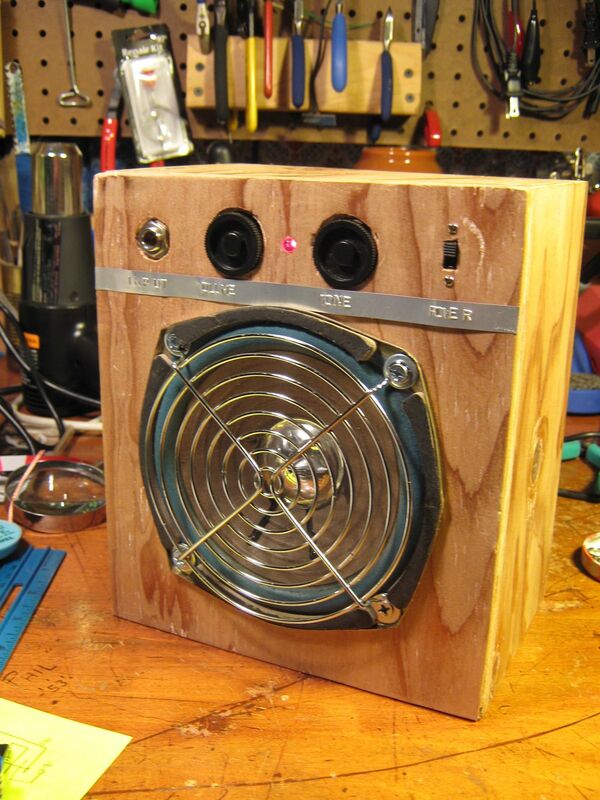 Much better than some smaller 3″ speakers from some other radio. Even better with an 8″ closed Realistic 1 stereo speaker, though that’s got some funny resonant frequency I need to damp. 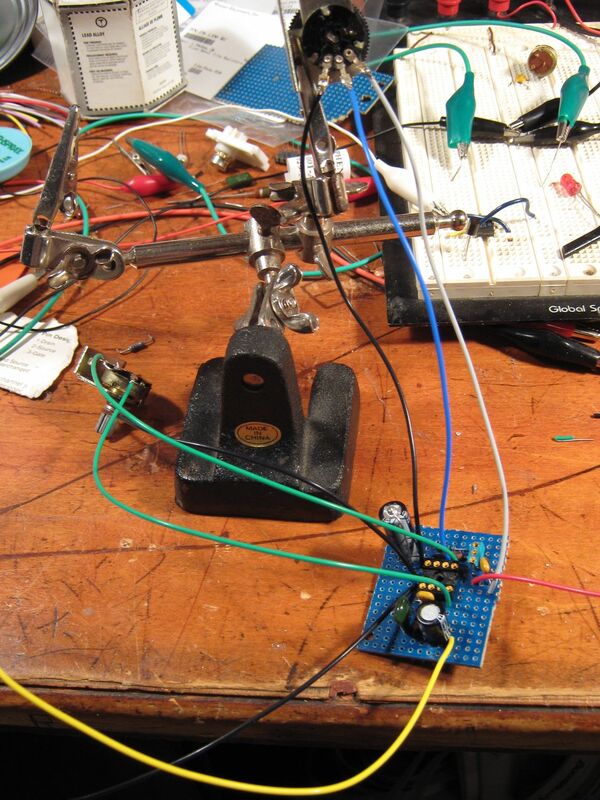 When I first protoyped the circuit I had issues with oscillation and weird behavior. Some of that was just dirty pots (they came out of a 70’s era cassette player, I think) and possibly some sketchyness on the part of the breadboard, but the main issue was the power supply filter cap – it was too far away. Weirdness ceased after I moved it close to the chip. It took me a ridiculously long time to design and build a simple box of 1/2″ plywood and stuff everything into it. I want it decent looking, right? And useable, small, and to not fall apart after a while. I sketched a page of ideas, built a few more in Sketchup, and then ignored most of that and just made it up to fit the piece of plywood I had. I didn’t bother making it very pretty, just some wood glue and sawdust in a couple really large voids and a coat of furniture wax to make it look vaguely finished but not so finished I’m afraid to mar it. Because of the particular pots and knobs I used I had to counterbore them slightly, and didn’t plan ahead for that. 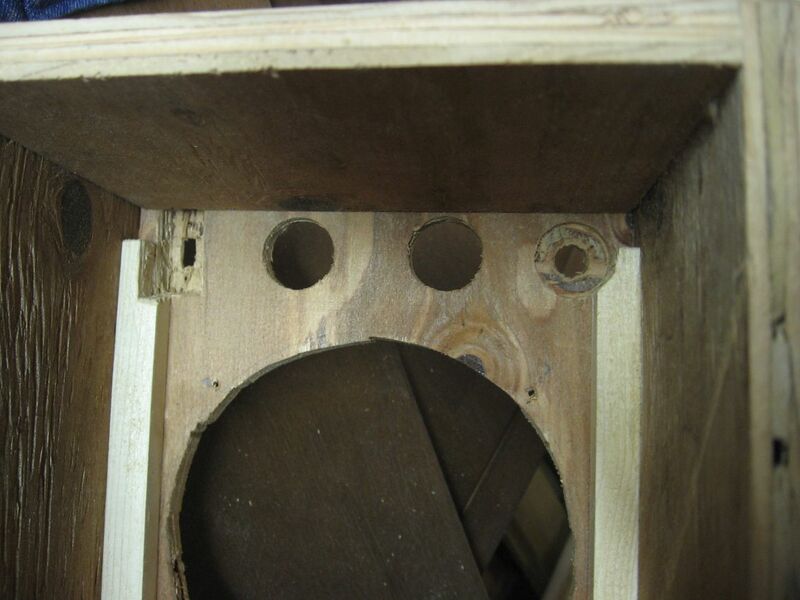 Hence the slightly bodged holes. I also rear mounted the power switch, which involved some fancy utility knifing (I don’t have any chisels small enough) but worked remarkably well. It fits the cheap 80’s plastic control theme and doesn’t stick out where it can get knocked or broken. I usually tend to go overboard with connectors and modularity, but that’s usually not really necessary. 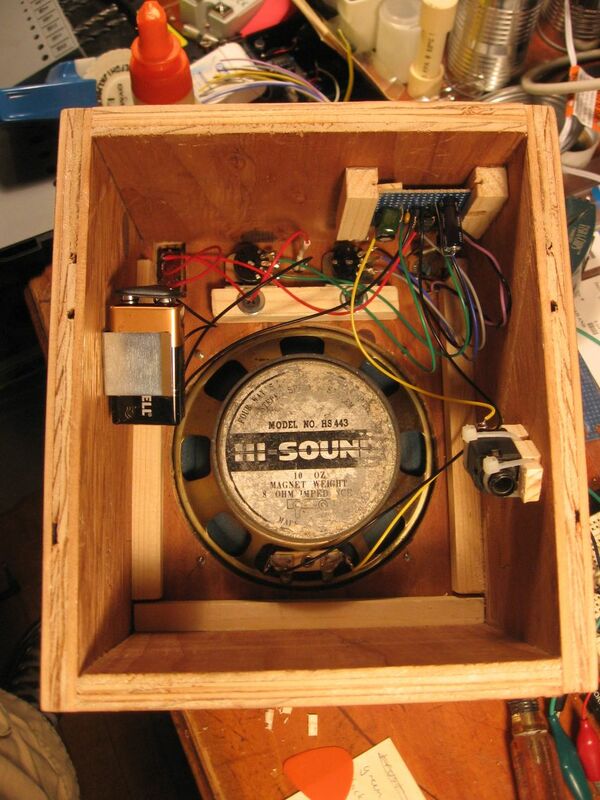 I kept my special features down to a speaker out jack so I can use this for testing other speakers or cabs as well. All the wiring to things outboard of the PCB is just soldered where it needs to be and long enough to not yank stuff apart if I have to move the circuit board around. All scrap 24 gauge teflon insulated wire from work. It works, it’s small, and it sounds OK. Not nearly as good as my big amp, nor does it have much low end, but it’s not bad. Still haven’t run a battery dead. Need to record some more sound clips, but it sounds surprisingly impressive cranked all the way up and driven with a cranked fuzz. I have a bit of this recorded for a friend’s track somewhere, using an Ibanez ArtCore (neck humbucker, I think) and close-mic’d with a medium-diaphram condenser. Add a tone stack. I’d also test and voice the amp using a more normal cab; I voiced the EQ tweaks using only itself so it sounds a bit muddy through both my 1×10 and 1×12 cabs. It’s not as well balanced and versatile as I’d like, but it’s decent for what it is. 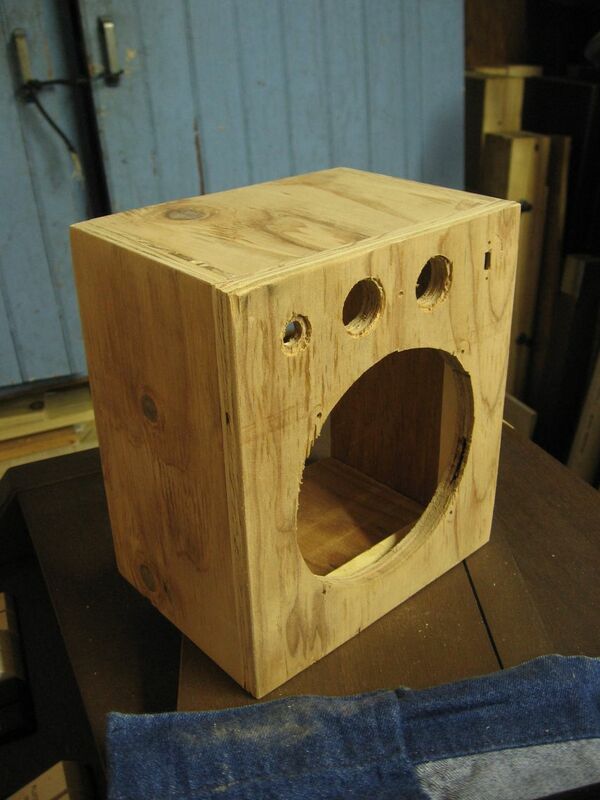 This entry was posted in Guitar, Projects and tagged Guitar, Projects by The One True Stickman. Bookmark the permalink.